According to reporting from ABC 10 News, Jamie Green — a Miami-Dade County high school security guard — has been arrested on multiple drug charges. The arrest report indicates that Mr. Green was pulled over by local law enforcement officers shortly after an undercover detective allegedly watched him sell drugs to a buyer at a nearby gas station. ABC 10 News reports that police were acting on an anonymous tip that they had received. Upon pulling over Mr. Green, police officers discovered a small amount of cocaine in his vehicle. Later, after police executed a search warrant on his home, they found a large amount of cocaine and marijuana. Notably, Mr. Green was arrested during schools hours. Notably, if a person is caught possessing or distributing banned substances within 1000 feet of any of the above listed places, they could face increased penalties. In fact, they could even be charged with a first degree felony offense. Many people underestimate just how much distance is covered by 1000 feet, especially in an urban environment. It is possible to be caught in a drug free zone without being aware of that fact prior to the charge being applied. There has even been a push to reduce these drug free zones down to 250 feet — on the grounds that too many people were being hit with harsh drug penalties when they had no knowledge that they were in a protected zone at all and they had no specific relationship to the school or the entity being protected. However, that bill failed in the Florida state legislature. 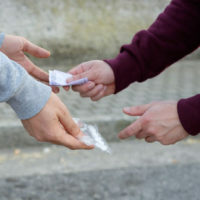 If you or a loved one is facing charges for possessing or selling a controlled substance in a drug free zone, it is imperative that you consult with an experienced Florida criminal defense lawyer immediately. Your lawyer will be able to protect your rights. At Ratzan & Faccidomo, LLC, our Miami criminal defense attorneys have the skills and experience required to handle the full range of drug crimes cases. If you or a family member was arrested for a drug-related offense in South Florida, you need a skilled legal advocate by your side. For a free, fully private legal consultation, please do not hesitate to call our Miami law office today at 305-600-3519.